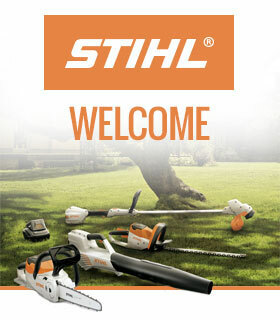 STIHL’s new range of 2 Series petrol lawn mowers have been designed with efficiency and affordability in mind. 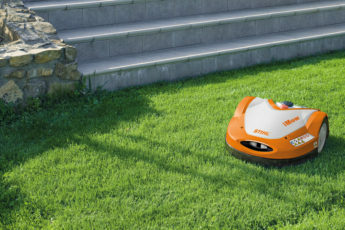 They feature simple and robust designs and are great at cutting and collecting – making these lawn mowers perfect if you have a medium-sized garden. The first model in this range is the RM 248. The RM 248 is a push-along mower with a STIHL EVC 200 engine and is designed to mow lawns of up to 1200m2 with ease. A practical model, it manoeuvres easily around your garden and is extremely comfortable to use with its super-soft grip handlebars. The RM 248 can be compactly stored away thanks to its foldable handlebar, meaning you can find a home for this machine even if space isn’t on your side! The large 55-litre grass catcher box means you need to take less breaks to empty it and can finish the job quickly so you still have plenty of time for other jobs around the garden (or to relax on the patio with a pint of beer or a glass of wine…!). We also have the RM 248 T, which has 1-speed drive and a Briggs and Stratton 450 series engine to propel the mower without it being physically pushed. 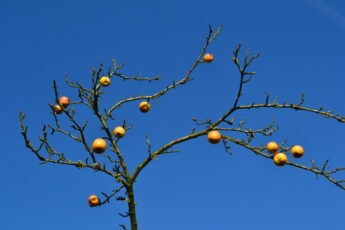 It makes working a lot easier especially if you have a lot of slopes in your garden! 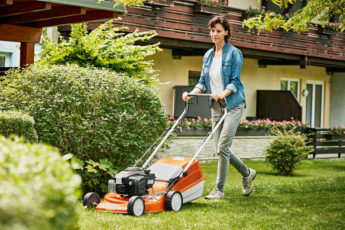 If you have a slightly larger garden, you could also look at the RM 253 T which is STIHL’s most powerful 2 Series petrol lawn mower. It features a Briggs and Stratton 625 engine for lawns of up to 1800m2. Much like the RM 248 T, this model is self-propelled, making it a great choice for tackling steep gardens. It also features a ReadyStart engine which means you can start the mower easily whether it’s warm or cold. Another feature that is shared by all of our 2 Series mowers is the adjustable spring-loaded central cutting height system. There are seven settings ranging from 25 to 75 mm so you can cut the grass to whatever height suits you. And if you prefer a mulching lawn mower, the final model in the range is the RM 2 RT. This lawn mower is different to the others in the range as it mulches the grass rather than collecting it. Mulching is where the grass is shredded finely by the mower then dropped back onto the ground below, acting as a natural way of fertilising the lawn – and best of all, it’s completely free! 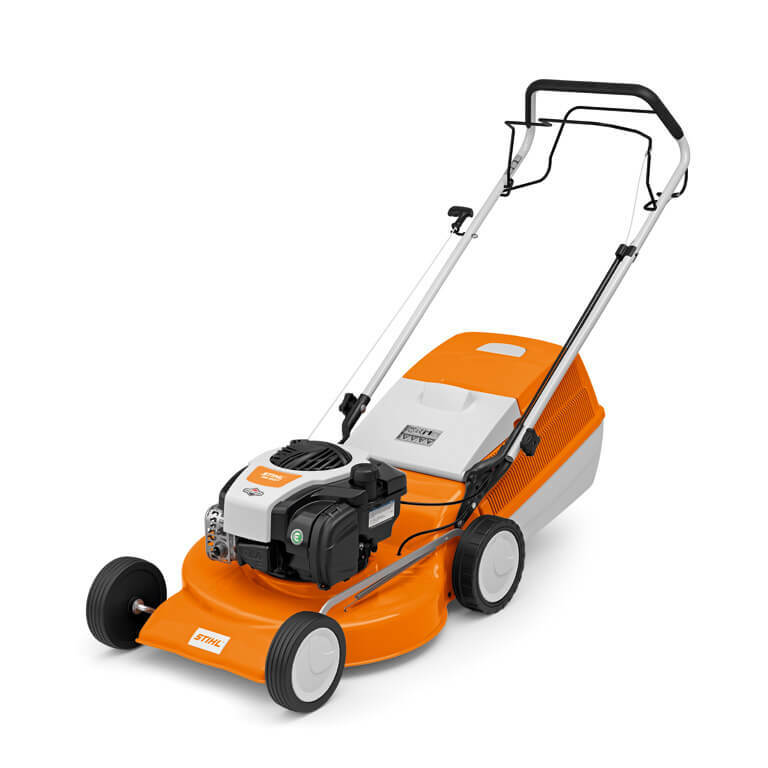 All of STIHL’s 2 Series petrol lawn mowers come with 5-year extended domestic warranty. 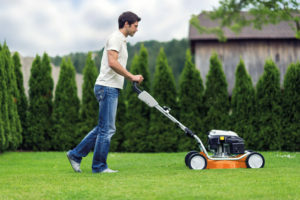 These lawn mowers are a fantastic choice for a medium-sized lawn, but they can also be used on larger gardens thanks to their practicality and reliability. Find your nearest STIHL dealer here now to get yours and let us know what you love about it in the comments below!